You might have heard that I recently opened enrollment in my signature course, Writing for Money. ???? ✍???? ???? A lot of you have sent in questions, so I figured that the easiest thing to do was give you an inside look at the course so you can decide if it’s right for you. Writing for Money is hosted on Teachable, which is a great platform for online courses. Teachable offers a way for me to provide video and text lessons, downloadable worksheets, quizzes, and more, all in one convenient place — and you don’t have to download any special software to make it work. New modules are released according to the course schedule that I set, so everyone has access to lessons at the same time. You just log in, start the lesson you want, and keep going. It’s important for you to actually DO the work in the course, not just read lessons and watch videos, so Writing for Money has a lot of worksheets and assignments. Students are strongly encouraged to take selfies, too, because we all deserve to brag when we’re doing amazing work, right? I LOVE to talk about freelance writing. I REALLY LOVE to talk to my students about freelance writing. Basically, what I’m saying is that every single student who enrolls in Writing for Money gets to have a call with me — and that’s really because I LOVE TO TALK TO MY STUDENTS. These calls aren’t just fun, though — they’re also a place where some of the BEST work happens. For example, one one call, my student told me that she knew she wanted to write for business. “Okay, but WHAT do you want to write for business?” I asked. “I don’t know. I just want to write for business, because I want to make money,” she said. … MONEY should not be your PRIME motivator when you choose a niche. You need to have a WHY. You need to have something that you WANT to write because it EXCITES you. Back to my student. She thought that she “should” go into business writing, but she kept talking about articles. And then she mentioned health. Please. You’re not supposed to know anything. That’s WHY you’re working with someone who ALREADY MADE ALL THE MISTAKES. I explained that trade magazines are magazines written for specific industries. They’re different from the consumer magazines that you can buy at the grocery store. Instead of pitching ideas to editors, they come to you with assignments. The work — and the pay — tend to be steady. By the end of the call, my student had an action list of trade magazines to research. She’s looking into health organizations that need newsletters written. She’s going to get PAID to write what she WANTS to write — and that’s the kind of work we do on these calls. The calls are seriously awesome. Plus, we have a private Facebook group, just for students, and BOY do we have fun there. Um, I mean, we are totally serious and committed to study at all time. During the course, we also do weekly live office hours, where I answer all the questions you have LIVE, on the spot. You can ask questions ahead of time, and of course, all the sessions are recorded, so if you can’t make it live, no big deal. Watch it later. Wondering what’s covered in the course? Oh, just everything you need to know to start a successful freelance writing business and make real money, month after month. Specifically, we spend the first week on some seriously important foundational work: getting your mindset right, establishing the habits you need to have in place if you want to run a business, and the all-important time management piece. Look, I have five kids, so I get it. You don’t have time, and you have NO IDEA how you’ll get all this done. In week one, you figure that piece out. Seriously, it’s kind of like magic. Next, it’s time to choose a niche. Now, I know this is a stumbling block for many people, which is why it gets its own week. Also, remember those one-on-one calls? They help. Also, we create a comprehensive income plan. Because it’s nice to say, I want to make $2000 a month, but I want you to know how you’re going to make that happen. The third week is an implementation week. I’ve taught this course a few times now, and I know exactly where people get stuck. So I’ve built in extra time to make sure that everyone gets UNstuck. Ask anyone in any of my courses. I am totally committed to the success of my students. 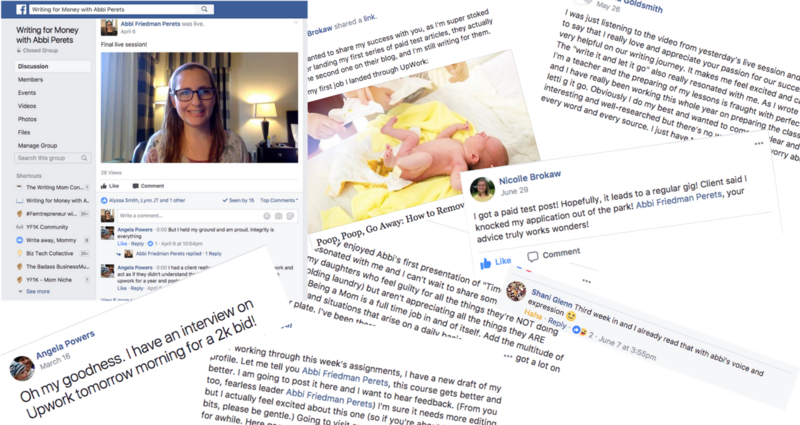 In week four, you get insanely explicit, step-by-step instructions for building an Upwork profile, complete with portfolio items, even if you have no professional experience. This means that you can start getting paid for your work. Yes, really. And we’ll be covering some other job sites as well, because the same principles apply again and again. But we don’t just learn Upwork. During week five, we cover three different strategies for finding you clients and getting you work. You get hands-on instruction, checklists, templates, and everything else you could possibly need to get out there and get yourself some paying work. The following week is another implementation week, to give you time to get out there and go after the work. And you get direct support from me — and the rest of the class — the whole time. Finally, you get all the tools and training you need to do the work once you have it. We don’t leave anything to chance. We create a whole slew of smart systems for you so that you’re ready to rock it. 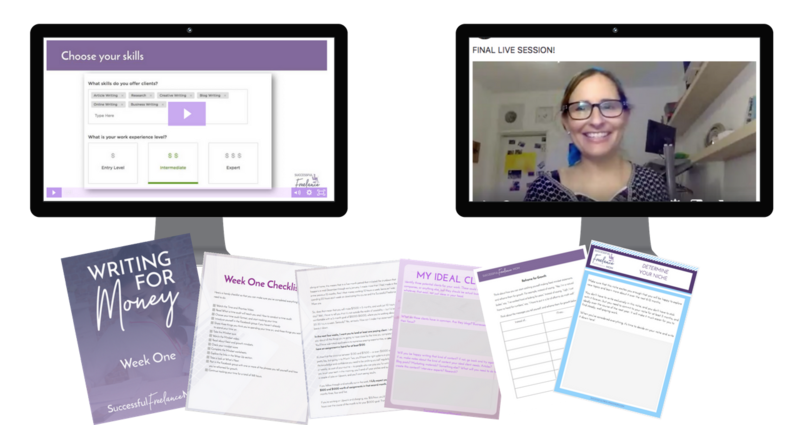 This time around, I’ve created four incredible bonuses and included them along with the course. Because who doesn’t love bonuses? The first bonus is Intro to Content Marketing. In this mini-course, you’ll learn what content marketing is, how you can use it to market yourself as a freelancer, and how you can make a great income selling content marketing services to clients. Next is Intro to Writing for Magazines. This mini-course covers, well, how to write for magazines, from finding ideas to writing a query letter (complete with templates) to understanding how trade magazines work and why you should pursue them, and the most critical skill a magazine writer needs to have. The Project Kickoff Package has everything you need to start a new project with a client — all the forms, templates, and systems that you need, right here and waiting for you to customize and use them. And How to Delight Your Clients is a masterclass that walks you through the processes and systems that I personally use in my business, and teaches you how you can consistently… well, delight your clients, by delivering exactly what they want. Option #1: Keep dreaming about getting started in freelance writing. Read blog posts and books, and sort through the conflicting advice you find. Go for it! Heck I did it — and it only took me 9 or 10 years to start earning consistently. As you implement what you learn, you’ll be able to pay off debt. You’ll enjoy the time you have at home with your children. You’ll contribute to your household finances with a sustainable, steady income.